Unless you've been hiding under a rock for the past couple of years you probably know that sweet|salty Kate wrote a book. If you read Kate's blog (and I figure I've sent you there enough times to assume you have) and didn't buy it when it came out in Canada or the U.S. there's probably little I can say (that others haven't already said) that will convince you to finally drop a few shekels on this book. But I'm still going to try. First I have to digress. Kate Inglis wrote a book. A novel. I want to talk about how incredible it was to open this book and find so little of her there. I mean, her signature ethereal, gutpunching prose is all over this thing, but it's not about her at all. Every time I found myself lost in the narrative I had to put the book down just to marvel that Kate created this world, and remind myself that stories like this don't tell themselves and how carefully she crafted it and how much work it must have been. We've seen bloggers write books before, mostly memoirs that expand upon the voice already established on their blogs. I don't mean to denigrate those efforts (I've enjoyed quite a few of them), but I've always wanted to see more bloggers pursue fiction. I think the editors and agents approaching high-profile bloggers don't really see much potential beyond banking on their blog voice. One thing that makes Kate's third-person novel so remarkable is that it establishes a "mommy blogger" as a writer of narrative fiction. I know she's almost done with the second novel in this series, and I find that so incredibly inspiring and impressive. So what is it I loved about this world Kate created? It bears some resemblance, I imagine, to the craggy, windswept place she actually inhabits on the Atlantic coast and captures so eloquently in her pictures. But what makes this world new is seeing it from the perspective of a boy still young enough to see possibilities his parents might long have written off. There are still pirates in Nova Scotia. They roam the barely-lit edges of his world but he has proof. It's a world filled with secret documents, maps, and mysterious totems. In other words, Kate has made a world where there is still adventure in the woods. But it's also the world inhabited by an old man who long ago should have written off such possibilities, but hasn't. It's a world where an old man might tinker with a rusty, well-oiled old engine inside his ancient barn rather than sit in front of the meaningless glow of a television set. It is a world of ticks, and dung, and lazy afternoons punctuated by the cries of peacocks. It's a world where neighbors still offer each other tea and home-baked scones and make jam from berries they pick along old stone walls. There is no internet in this book (born of a voice plucked from the internet). No big boxes scarring the Maritime landscape. This might be 1972 or 1985 or the 2010 you and I wish we lived in. And yet it is not a perfect world. There are pirates. And they have formed a union. I think I know some of these pirates' union brothers here in my own world. They rip scrap aluminum from vacant houses and steal copper pipes from their basements. 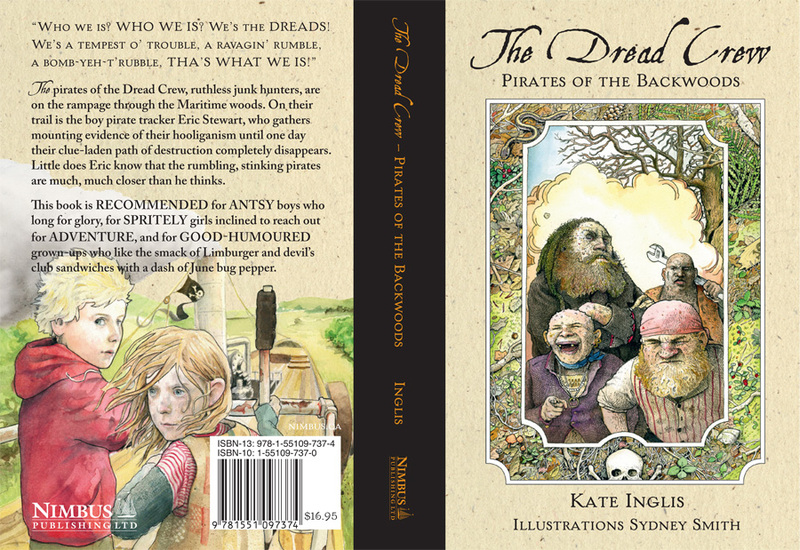 Around here we call them scrappers, but in Kate's world they are the dread crew. We know this isn't 1673, because these pirates don't roam the seven seas plucking precious metals from merchant ships. Their world, like ours, no longer boasts such easy targets. Instead we have stuff. Junk. Lots of it. And we don't know what to do with it all, so the pirates roam the woods and the edges of town looking for our junk to steal and scrap. And they have a really cool pirate ship. But until they meet an old man with the biggest collection of junk they've ever laid eyes on, they have no idea that they've been going about it all the wrong way. See, these pirates are profane. They are the grossest pirates you will ever meet, and your kids will love them. Trust me. They fart and smell like outdated French cheeses and their behavior is more uncouth than any character's you will encounter between Robert Louis Stevenson and Roald Dahl. 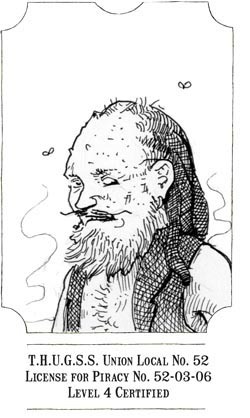 And their overall disgustingness is lovingly etched by Halifax native Sydney Smith who has a particular talent with stink lines, buzzing flies, warts, wrinkles, and glowering faces. Kids love stories about any creatures more poorly behaved than themselves, and the pirates of the backwoods will not disappoint even the most unruly jackanape under your roof. Early parts of the book were a bit beyond my daughter's comprehension, and I think you have to be seven or so to really begin to appreciate the story and Kate's prose. But when the pirates showed up, they made up for whatever went over her head. I think being able to see the pictures of each pirate really helped with her appreciation of those parts in the text. The book also imparts some important moral lessons as the pirates learn to tone down their behavior without cleaning up their act. I think my daughter also liked that one of the toughest pirates turns out to be a girl not much older than her. Should this have had a spoiler alert? I'm sorry. I'll stop. I don't ordinarily do reviews. But in the end, this book is important not just because it's good (it is) but also because of what it represents. It is a beautifully-written novel by a beloved blogger. And it should inspire other bloggers to believe in the power of their own voice beyond the blog post. One day Kate started a blog, and a bunch of people read her words because they were worth reading. And one day some editor e-mailed her and asked if she'd ever thought about writing a book, and she said something like, I've always wanted to write a novel about pirates. And she did. And that's pretty freaking cool, isn't it? First edition hardcovers can still be found on shelves at retailers such as Chapters.ca and Amazon.ca in Canada, and at Amazon.com and Barnes and Noble in the USA. To order the book from your favourite independent bookstore, ask them to order from Nimbus in Canada, and Orca Books in the USA. A fantastic source for (often author-signed) books is Halifax's beloved Woozles, who ship internationally. Second edition softcovers with a new Glossary of Terms have been distributed in both Canada and the United States, and are available from all retailers.